George Best (22 May 1946 – 25 November 2005) was a Northern Irish professional football player, best known for his years with Manchester United. He was a winger whose game combined pace, acceleration, balance, two-footedness, goal scoring and the ability to beat defenders. In 1968, his annus mirabilis, he won the European Cup with Manchester United, and was named the European Footballer of the Year. When fit, he was an automatic choice for the Northern Ireland team, but he was unable to lead them to the World Cup qualification, despite being capped 37 times and scoring nine goals. In 1999, he was voted 11th at the IFFHS European Player of the Century election, and 16th in the World Player of the Century election. Pelé named him as one of the 125 best living footballers in his 2004 FIFA 100 list and Best was named 19th, behind Gerd Müller, at the UEFA Golden Jubilee Poll. 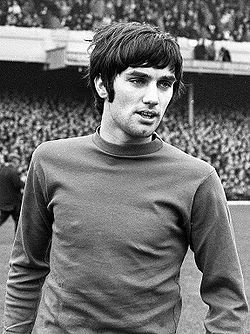 In his native Northern Ireland, the admiration for him is summed up by the local saying: "Maradona good; Pelé better; George Best." He was one of the first celebrity footballers, but his extravagant lifestyle led to problems with alcoholism which curtailed his playing career and eventually led to his death in November 2005 at the age of 59. His cause of death was multiple organ failure brought on by a kidney infection, a side effect of the immune-suppressive drugs he was required to take after a liver transplant. In 2007, GQ named him as one of the 50 most stylish men of the past 50 years.